The key thing in this problem is not to connect in response to the atari. 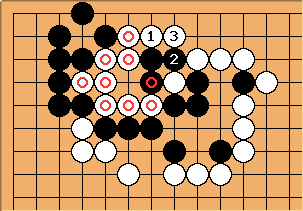 Rather, White should connect underneath with and , keeping the group safe and hence killing the entire Black group. If at , then White plays at instead. 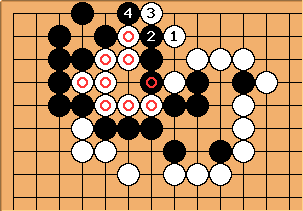 If connects, then wins the capturing race against the group, by three liberties to two. The rather funky-looking is a step in the right direction, but not the solution. and can create a throw-in ko. ProtoDeuteric: If it is not to imposing of me, would you please give me the credit for this solution? I put the exact solution sequence on the attempts page before you created the solution page.